Census returns are among the most popular records used by family historians and other researchers, but many of us give little thought as to what went on behind the scenes every time a census was taken. This talk explores the creation of the census, with the mass organisation of enumerators, temporary clerks, permanent civil service clerks and registrars, as well as the fascinating stories that lie behind each census, to help us better understand the records we think we know so well. Counting the people: behind the scenes of the census. I find the census absolutely fascinating. I’ve looked at it every day, or nearly every day for the last 20 something years and I’m still fascinated by it. As historians, or family historians, we use an awful lot of records and we always have to remind ourselves that the reason they were created in the first place, wasn’t just for our benefit; they were created for some other reason, but it’s very hard to remember that sometimes with the census because it is so well designed. It’s as though you asked family historians, or social, local historians, population historians, ‘What sort of record would you like to have of people who lived 100, 150 years ago?’, and you’d probably come up with something very like the census. But it was created for entirely different reasons. It was created to find out how many people we’d got, at the most basic, and also the information gathered was intended to be used for forward planning of one kind or another, and as you go through all the different census years you’ll see that the preoccupations of each particular age tend to be reflected in the sort of questions that are asked and answered. You get an awful lot in the Victorian period, which is most of what we can see, to do with health; they’re interested in disabilities, and blindness, and lunacy. Then when you get into the 20th century, as we’ve just seen with 1911, they start being very interested in questions of fertility, and numbers of rooms and overcrowding; that starts to come in in 1891. By the time you get into the 20th century, which I’m really not going to going to say very much about, the range of questions has expanded greatly, and you get questions added and then dropped for another census. It becomes a lot more complicated, but it always reflects what the current preoccupations are, so that in itself is something quite interesting about the census. Now as you’ll have gathered, because I’ve been doing this for so long and haven’t got bored with it yet, I find the census interesting in itself, and that, as far as I’m concerned, is a good enough reason, but if you’re using a census in pursuit of family history, local history, or something else, I always think that understanding how a record was created helps you understand better how to use it. So that’s another justification for wanting to know not just what is in the census but why it’s there and how it got there. This is how the census was taken (you probably know this.) This is fairly basic but it doesn’t hurt to recap; it uses the same registration districts as civil registration for births, marriages and deaths, and this is from 1841 which is the first useable census from our point of view, if we’re looking for names as opposed to just statistics. The census was taken every 10 years in most of Britain from 1801, but [regarding] the first four census years; the lists of names, if they were compiled at all, were not systematically kept. There are some, but they were never collected centrally, so if they do survive, they’re held locally. There are a couple of reference books that actually list fairly comprehensively which ones are known to survive, and quite a lot of the information’s also available on line. It’s patchy; there’s quite a lot for the City of London, a nice set for Harrow and various other places around the country. 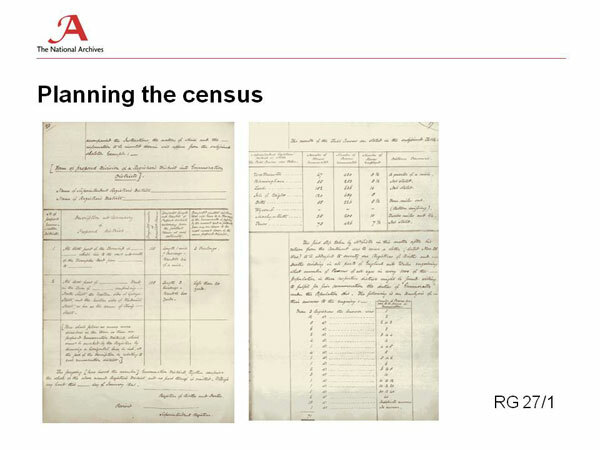 But the way the census was taken up to 1831 was [to be] taken by local officials of one sort or another, overseers of the poor often, and they were required to compile the statistics and then send the answers to London. The difference in 1841 as you’ll see is that not only were more questions asked and lists of names kept, but everything was done centrally. 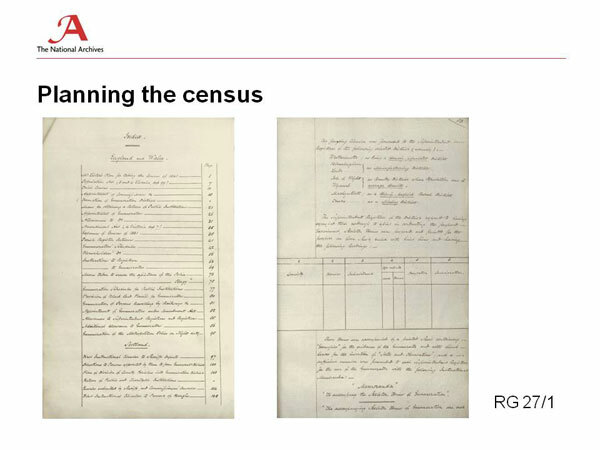 So once we’ve got to 1841, and for several censuses onwards, certainly all the ones that we get to look at, the enumerators distributed schedules to individual households and the householders filled them in, and they almost always did fill them in. You will often hear people say ‘Oh, the enumerators filled them in’. The enumerators did not have time. They might have done a few where you’d got someone who was illiterate and hadn’t got someone else to fill it in for them, but on the whole, somebody – if not the householder themselves – their literate child or a neighbour, or some local nosey-parker, will have filled it in. The enumerator collected them, (in theory at least and it mostly worked) took them home and then copied the information into enumeration books, and the enumeration books are what we see for all the censuses, 1841 to 1901 with very few exceptions. Of course the big difference comes in 1911, when the household schedules were distributed and collected exactly as before – they were a bit more elaborate, they had a bit more information in, but the system was the same, the enumerator went around, delivered all the schedules, collected them all in – but the difference was that he, and occasionally she, did not copy them into an enumeration book. The purpose of the enumeration book was so that the clerks in London could tabulate the information; they totted up. You’ve all seen pages of census where you can’t read the age which is the thing you really, really want because somebody with a big pencil has gone ‘tick, tick, tick, tick, tick’, like you do with a shopping list . They were totting up; there were totals all over the place, there were annotations – that’s what the enumeration book was for, because a clerk could work from an enumeration book. Trying to do the same thing with a pile of individual schedules was just not on. In 1911, they found a different way of doing things, which I’m sure you already know about, but just in case there is somebody who doesn’t know, we’ll create an element of suspense and I’ll tell you what happened later. The men behind the census – these two men here, Thomas Henry Lister and George Graham – they were actually the first two registrars general. Strictly speaking the real man behind the census predated both of those. He was a man called John Rickman, who was a clerk to the House of Commons, and although he did quite a lot of other things, he didn’t just organise the census, he was the man who organised and master-minded the censuses of 1801, 1811, 1821 and 1831. He rather inconsiderately chose to die in 1840, which didn’t leave very long to actually organise a replacement and a successor, but Lister, having been appointed the first registrar general in 1836, made a fair old job of organising the new civil registration system in 1837. He was then given the job of organising the 1841 census, which I also think he did rather well, considering he didn’t have a huge amount of notice. No, it didn’t come as a total shock to him; as far as I’m aware he had been working with Rickman and was aware of what was going on, but suddenly in 1840 he became completely responsible for this whole new enterprise. It was taking a census in a completely different way. Unfortunately for Lister, who was exactly what he looks like (his other job was a romantic novelist) the poor man expired aged 42, in 1842, of tuberculosis, which was exactly the sort of thing a romantic novelist should expire from, but 42 is a bit young. However, poor old Lister, or poor young Lister, died in 1842, and his successor was George Graham, who was actually about the same age, but as you can see from the portrait there, he managed to live to a much greater age than 42. Graham was in fact the longest serving registrar general, He took over in 1842 and he retired in, I think, 1880, or thereabouts; before the 1881 census, although he had a lot to do with the preparation of it. So Lister set the system up, and then Graham refined it, so really these two men are responsible for the way the census developed, and I am particularly fond of George Graham. I have read a lot of his correspondence and notes and I find him very quotable. If I could go back in a Tardis and meet someone in history, I think I’d quite like to meet George Graham. Anyway; doing a census. Well, for every census, you had to have a Census Act, and every 10 years a new Census Act had to be passed, otherwise the census couldn’t go ahead. This particular one happens to be from 1871, but frankly one Act of Parliament does look remarkably like another. You see the act was passed in 1870, which doesn’t really give an awfully long time to get the whole mechanism up and running although they knew what they were doing by then. But, it did mean that the census wasn’t definitely going to go ahead until an act had been passed. So the Census Office couldn’t be set up; it was a completely separate temporary organisation that was set up usually a couple of years before the census and wound up a couple of years after when all the clerical work and the number crunching had been done and the reports published, and then it would all have to start up all over again. So it wasn’t a permanent office; it was a completely new thing every ten years. Now in practice you’d actually get a lot of the same people involved. What would happen is that Somerset House, the General Register Office, would second a few senior clerks, experienced men, who would run the census operation, but most of the staff would be recruited on a temporary basis, and I’m just talking about the clerks here, and the office cleaners and the porters. There was a tremendous amount of detail went into the planning and a lot of records have been left about exactly how the office was set up. There are also some documents that we have that show you get a number of people who were census clerks in one census year and then they’d go off and do, I don’t know, other temporary clerical work I suppose, and then they would come back and join the census office later. Sometimes the really good ones would be absorbed into the main establishment if they were vacancies, but it was a temporary office, and it moved around; it wasn’t in Somerset house because there wasn’t room. Somerset house was too full of what it was doing the rest of the year, so the census office tended to be in different places. 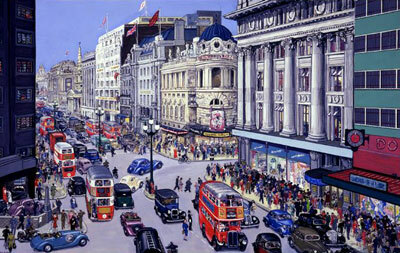 In 1841 it was in the Adelphi, and then it settled down for a number of census years at a place called Craig’s Court, just off Trafalgar Square, and eventually it went to Milbank, in a temporary structure; it seems to have been a fairly ‘high-tech’ tin-hut, but essentially, temporary tin-huts at Milbank. The difference came in 1920, when there was a permanent Census Act that put the whole thing in a permanent footing and allowed for the taking of the census every ten years. They did consider every five years at one point and that would have been interesting, but was not surprisingly turned down by the Treasury on the grounds of cost, as were lots of other things. So that’s the Census Act, and this would be what got the ball rolling every ten years. Well, the very first time of course, this was unknown territory, and this is just part of a document which I know you won’t be able to read, but I can tell you; this is just the first two pages of something that actually runs to 147 pages, and it’s all in manuscript. It’s absolutely beautifully done, and this was all Thomas Henry Lister’s planning; the first page there is a very detailed list of contents of all these different aspects that are going to be covered in the census. What you might just be able to read is the sub-heading, three quarters of the way down the page, which says: Scotland. And this is because England had a Registrar General from 1836, but Scotland didn’t have a Registrar General until 1855, so the 1841 and the 1851 censuses for Scotland were actually run by the English Registrar General, and it wasn’t until the early 20th century that the records of those censuses were actually sent back to Scotland. The Scottish census, if you’ve never looked at it, is virtually identical to the England and Wales one. There are a couple of tiny details that are different, but really nothing of great significance and it’s probably worth mentioning here, just in case anyone doesn’t know; the census that we have here in the National Archives, and in copy form absolutely everywhere else now, is the census not just for England and Wales, which was within the jurisdiction of the Registrar General, but also the Channel Islands and the Isle of Man. 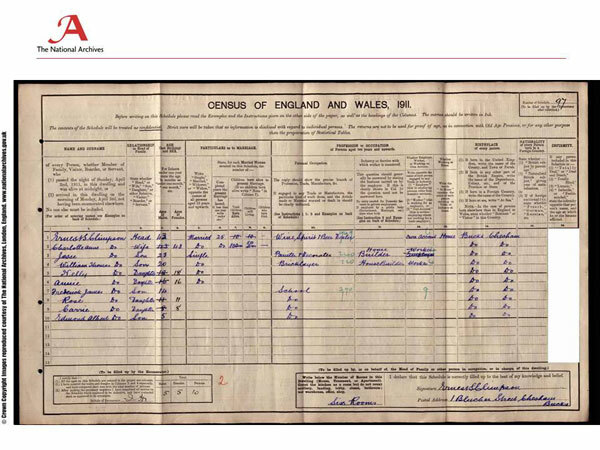 They had their own systems for recording births, marriages and deaths, eventually, but for census purposes they came under the Registrar General for England and Wales, and again the censuses there were virtually identical to the English and Welsh ones. And this is just the beginning of the planning and it was extremely meticulous; the page on the right, again you won’t be able to read it, but you can see the shape of it, and this is a very neatly drawn rough draft of what was to become a page of the 1841 enumeration books. It’s just the headings, but if you look at it, if you’re familiar with the 1841 census, you’ll see, yes, that’s just about the shape of it, and there was lots and lots more. All of the pages of this, you can see them all online, free. There’s a wonderful, wonderful site called Histpop.org, and that is absolutely wonderful. Most although not all of the illustrations that I’ve got here are from there. They’ve scanned lots and lots of documents, some of them ours, some of them are bits from newspapers, some of them are bits from parliamentary papers, but it’s absolutely wonderful if you’re interested in the background to the census, and to civil registration. As well as lots of documents for all of the census years, there are also lots of essays, many of them by Eddie Higgs [lecturer recommends author’s books], and it’s a wonderful site if you’re interested in the background. It’s not much good for genealogists; you will find very few lists of names in there – if you look really hard you’ll find some – but it’s an absolute goldmine if you’re really interested in all the documents that went into planning the census, carrying it out; lots of correspondence. That’s just a suggestion of the sort of planning that went into it. Lister was very meticulous; one of the headings here – he’s even thought about the logistics of distributing lead pencils to all the enumerators so they’ve all got something to write with. And that’s one of the reasons 1841 can be quite hard to read because they did it in pencil. They even did little sample censuses to test the system out to see how it would work, and it’s absolutely wonderful. I’m such a sad old anorak – I sit there and read this stuff for pleasure. That’s just a little hint of the sort of things that you’ll find when you start digging. Now, I’m not going to show you really familiar documents. I’m assuming, possibly wrongly, that you’re all fairly familiar with the census, with what’s on the census sites and if you’re not, in a matter of five minutes of leaving this room you can go and look at any computer and see as much census as your eyes can take, so, what I’m going to show you are things you may not see very often, and in some cases. I hope that you’ve never seen at all. This is a household schedule; this one happens to be for 1851. Now these were not routinely kept; once the enumeration books had been completed, and all the clerical work done, the household schedules would then be destroyed. They were kept for a while, because there may be some queries, they might find a gap in the enumeration book and need to go back to the original schedules, but these as you can imagine took up an awful lot of space, so they were disposed of, and occasionally, stray ones survived. This particular one – which is not especially interesting, it’s just an example – is from Newcastle on Tyne, and this is the back of it, where you’ve got the householder’s name and address, and this is all the instructions as to how to fill it in, and on the other side (this will look a lot more familiar) this is the page that they actually filled in, and there is not quite a whole enumeration district but a substantial part of one in Newcastle on Tyne in 1851, where there is no enumeration book; it seems to stop about half way through, and then you just have all the household schedules. I don’t know what happened, I haven’t found any account of it or record of it. My best guess would be that the enumeration book was completed, and then the dog ate it or it got dropped in a puddle and some of the pages were damaged beyond repair, so they just used the schedules, or it could be that the enumerator was just very slow or dropped dead in the middle of it and it never got copied up. But for whatever reason I’m very glad that we’ve actually got a selection of household schedules, so it’s just nice to see, though they’re not especially riveting, but it’s just nice to see what they look like, and that’s a fairly ordinary run of the mill example, well actually it’s quite a posh family; it seems to be rather a nice part of Newcastle on Tyne because it’s all servant-keeping families. Now as well as the household schedules which you don’t very often see, there were other special schedules for institutions and for vessels, and these ones, unlike the household schedules, they were not copied up into enumeration books. They were just left as they were, so when you’re going through the census, researching it, if you find somebody who’s in an institution or who’s on a vessel, you will get the actual schedule. 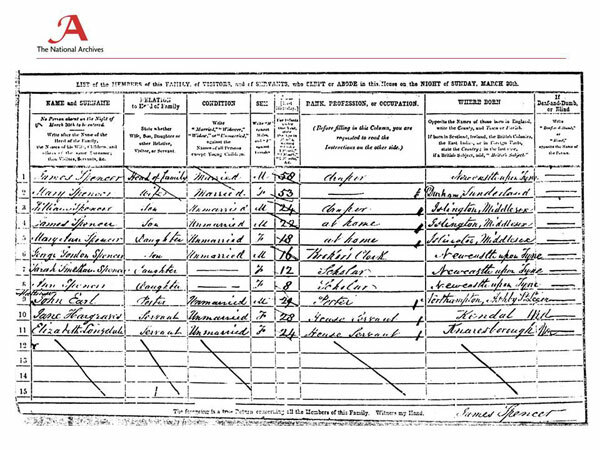 So sometimes in the census, before 1911, you will find something which may be in your ancestors own handwriting. Your best bet is if they’re either something like the master of a workhouse, who was a sort of ex-officio enumerator, or if it was somebody on a fairly small vessel, someone on a canal barge, or a fairly small boat. Not great if somebody’s on a Royal Navy ship because it would just be some Navy clerk who just copied out from the ship’s muster or something like that, although I’ve noticed with some of the Navy schedules, they were terribly precise about ages. You won’t get any of this nonsense of 25, 13, 41, you get years, and months, all very neatly written, sometimes, in the Royal Navy ones. The Navy were pretty good at paperwork sometimes. In 1841, they didn’t actually think about vessels. That was one of the things that Lister didn’t think about. From 1851 onwards, there was some attempt to enumerate vessels. It was never easy, because the thing about vessels is, on the whole, they move, and the logistics of getting schedules delivered to a boat and then getting them back again could be quite tricky. It’s all right if you’ve got a nice little houseboat that doesn’t actually move, then that’s just a house that happens to be on water, but of course if you’ve got working boats plying up and down rivers and up and down the coast, or in the case of larger ships of course, they could be away at sea and you might deliver papers to a merchant ship, which then sets off on a voyage to South America – well, you’re not going to be able to collect the papers from it the week after. Similarly you will get ships coming in to port which didn’t have papers given to them because they were on Cape Horn or something, so it’s always a bit hit and miss, the recording of either merchant shipping or Royal Naval shipping, so you might or might not find something, and the arrangements did vary from census year to census year, so it’s worth having a look but don’t get too hopeful; again, if you think about how it was done you can understand why it’s not going to be as systematic and as complete as the on-land ones. 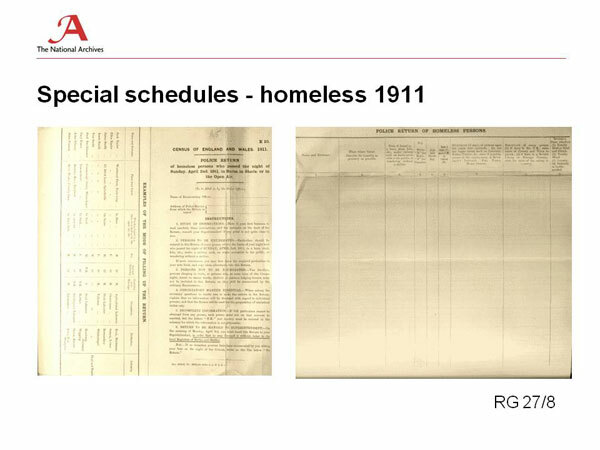 Now there was another kind of schedule which I’ve got a couple of examples of here from 1911, and these were special schedules that were created for recording people who were homeless; this was people sheltering in barns and under railway arches, sleeping on park benches, and of course famously in 1911, Suffragettes, who were boycotting the census and were assembling outdoors. The enumerator was to enumerate everybody who was in a dwelling, but the police were given these special schedules so they could go and enumerate people who were not in dwellings, so if somebody was in a barn, that was supposed to be the police because that wasn’t a dwelling. I haven’t actually seen one of these filled in because what the police were to do once they had collected the information, or such information as they could get, was to pass it on to the enumerator for the area who would then write it up on a normal schedule. If you want to go and play with 1911 [census] and just put in as the key ‘homeless’ you find some quite interesting ones; my favourite is actually a sailor who is stuck on a station platform because he’s missed his last train and if you keep exploring I’m sure you’ll find some interesting examples, and you will find quite a lot of Suffragettes as well. The police and the authorities were instructed to do the best they could, if they couldn’t get actual names and details, they could at least do a rough head count and make educated guesses as best they dared as to ages of the females concerned. 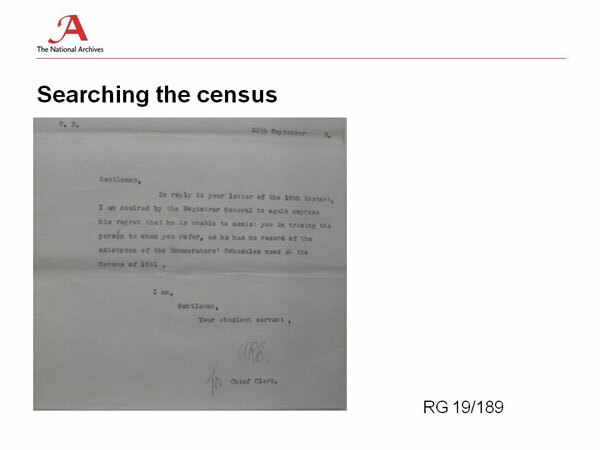 There is some research going on now that 1911 is open, into precisely how many people successfully avoided the census and what got put down – some really, really interesting returns on that. So that’s a homeless schedule, which is something you’re very unlikely to come across so that’s why I thought I’d show you. Now this is another, a really special schedule, and this again is something that I found on the Histpop site; it’s one of the few things that is a list of names. Now I mentioned how enumerating people on vessels was very tricky because you didn’t know where they were going to be, and if you look in 1901, you will find that there is a big list of Royal Navy ships, but there’s a whole batch of them seem to be missing. It seems to be those where the name of the ship starts with the letter ‘C’, which means that they’d obviously got as far as the Admiralty, or they’d got as far as the General Register office and then somebody mislaid a box, or accidentally threw something away, because it’s beyond coincidence for ships beginning with a ‘C’ all to accidentally not be enumerated. Well, it might have been, it might not have been, but they weren’t sure, so this, although it is just on ordinary foolscap style paper, is an enumeration of all the men who were on Cygnet. That’s just one page of it; there are about 64 men in total, who are not on the 1901 census site, because either the enumeration schedule for the ship was never returned, or it was and it got lost, but here is a substitute of it. 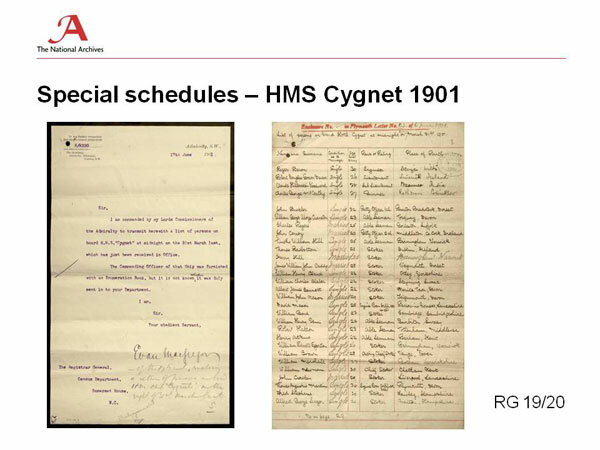 So, if you have someone in the Navy, who is missing in 1901, and you think there is some chance that he might be on HMS Cygnet, have a look – he might be there. I was really pleased when I found that, because I like census oddities as you’ll gather. So that’s a wonderful bit of serendipity and it just shows that although we have listings in our catalogue that are bits of census or any other record that is known to be missing, just occasionally, very rarely, something turns up that we thought was missing or in this case an acceptable substitute. So I’m very pleased about that one. Now something else they had to deal with when taking the census, apart from the different kinds of schedules they had to produce for households and for institutions, there were lots and lots of different ones; you had household schedules, and you had large household schedules, you had institutional schedules and they came in different sizes, depending on when it was just a sort of roomy boarding school or something absolutely huge, like a major prison or a barracks. There were lots and lots of different sample ones that we have, many of them are on the Histpop site, and there were different ones produced for different places: you’ve got the Scottish ones and the Welsh ones, and the Channel Islands and the Isle of Man, and in the case of the Welsh ones, you get them in Welsh. This is just a sample one, this is not a filled in one, it’s just a sample page, and this is the Welsh one for 1871, and they were always produced in Welsh right from 1841, a Welsh language version was produced. I think the first one that they did; they had to recall it because there was a mistake on it, but they got it, they got it done and they were always very conscious that the Welsh language and the Welsh speakers had to be catered for. 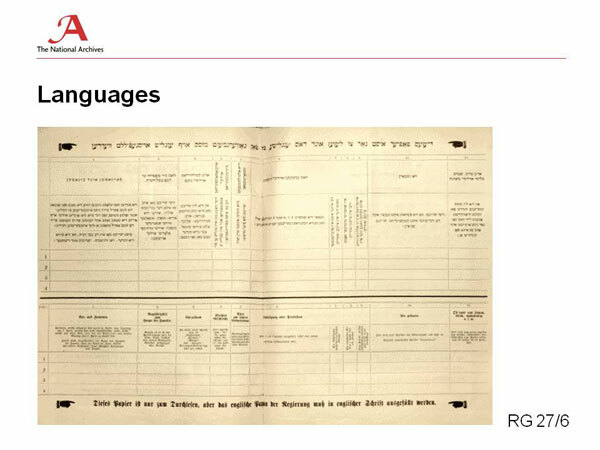 That was always done, but much, much later, from 1891, you got something altogether different; this is not a full one, this is just a sample (but there are samples you can look at) that was produced in Yiddish, and in German, and this was because from 1891, you had large numbers of Jewish migrants, particularly in the East End of London but in other places as well, and the census authorities went to great pains to try and make sure that they included this very significant part of the population, and they enlisted the help of Jewish organisations and synagogues to encourage people to fill them in. Now if you think about a lot of Jewish migrants in the late 19th century, they would come from Eastern Europe, and they hadn’t just come strolling across to see if they could do a bit better; some of them were actively fleeing from persecution, particularly if they’d come from somewhere like Russia, parts of the Russian Empire, and they had a very healthy fear and scepticism about authority generally. The synagogues and other Jewish organisations worked with the census authorities [to prove] that it really was just a census, there was nothing more sinister, there was no secret police thing. The confidentiality thing in the census, on the whole was very, very well kept. There were a couple of breaches; in one case, it was 1861 or 1871, I’ve forgotten which, where a local enumerator ratted to the education authorities, on some people who hadn’t been sending their school-age children to school, but that was exceptional, and the fact that it was newsworthy just shows that it was exceptional. The whole point of taking the census was to make estimates, and nowadays if you’re trying to do a survey of some kind (and actually the successor to the original Census Office, which is now the Office for National Statistics and it’s been about half a dozen other things, they do surveys now, they do the household surveys which is a much, much smaller sample) and you’ve got a sample which has got something like 1,000 or so, that’s a pretty good sample if you choose it correctly. The census is a survey where your sample is close to 100%, so even if you have people deliberately putting falsehoods down, people making mistakes, people evading it, on the whole, you’re still going to have a most fantastically accurate survey. That remember was the point of it, it wasn’t to get everything about everybody, it was to get most of the information about most people, which is all that you need if you’re trying to do a survey. And while I have never ever seen this written down explicitly, it did strike me and presumably struck Lister and the other people who were setting out to do 1841and in some cases the earlier ones, that the best way of trying to get everybody listed once and nobody twice, is to list them by name. So that’s the incidental benefit to us; we’ve got all these names because it was probably the best way of getting an accurate list, but the authorities themselves were not that interested in individuals. They were interested in groups of individuals, trends and figures and suchlike, but it almost could have been designed for the family historian and the social historian. 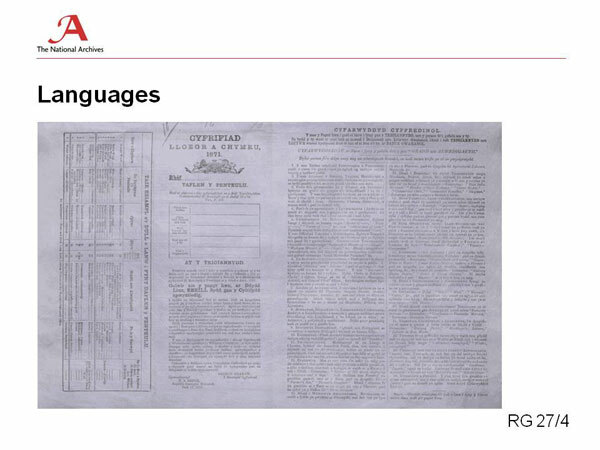 Well this was the bit about the languages, and I’ve mentioned several times the enumerators. I just want to say a little bit more about them. The illustration there is one of the many, many pieces of paperwork that were generated. This happens to be an enumerator’s claim form from 1891. I haven’t seen one for an earlier year than that, but I’m guessing they probably were fairly similar to that. Now, the enumerators first of all had to be recruited every ten years, and right up until the 1921 census, the organisation was the responsibility of the Superintendant registrar who was in charge of each registration district, and the local registrars of births and deaths, who were responsible for sub-districts. Each registrar of a sub-district had to recruit enumerators sufficient for the area, and also had to come up with what was called ‘a plan of division’, which was dividing up the area into enumeration sized chunks. They varied an awful lot; an enumeration district was meant to be an area that an enumerator could reasonably cover in a day, to deliver, and then another day, to collect afterwards. So in somewhere like St James Westminster, which I think was the most densely populated, that would be physically a very, very small area indeed, because you’ve got a lot of people living quite literally on top of each other in tenements, lots and lots of households within a very small distance. So each enumeration district would have a lot of people in it because there wasn’t much distance between the households so he didn’t spend a lot of time walking between them, he spent most of his time shoving things through letterboxes or asking for them. But in somewhere like mid-Wales or the North York moors, an enumeration district would be absolutely vast. It might have very few people in it, because the enumerator spent most of his time going between the individual farms or hamlets either on foot or on horseback, so you get enormous variation in the actual numbers, but the idea was that it was meant to be about a day’s walk for each enumerator. Now this probably worked reasonably well in 1841 and 1851, but one of the problems is that as the population was increasing, which it was, and we know this from the census of course. For the latter half of the 19th century, it wasn’t increasing nice and evenly all over the country of course, people were piling into the towns, so you do end up getting some enumeration districts which were huge, and some of which were dwindling away. My favourite one is actually in a parish in Sussex, which was quite newsworthy in 1851 because the population had doubled since the last census. In 1841 the population was one, and in 1851 it was two, and it was one of those old parishes that had sort of fallen into the sea, and the only dwelling within it was a toll house. And in 1841 it was occupied by a single man, and in 1851 it was occupied by a married couple. So the local newspapers said ‘oh evidently the man had taken a wife’, well actually he didn’t, it’s rather disappointing because it’s a different man, but I quite like that, it’s rather sweet. That’s an extreme example of how districts did not actually quite meet the pattern. Over the years it tended to get worse, for reasons to do with registrars’ work status. You didn’t get nice sensible boundary commission type divisions, you tended to get small piecemeal divisions of registration districts for the whole of the period we’re looking at. And they didn’t really revise the census districts as thoroughly as they might, so you do sometimes get some poor enumerators, particularly in the East End of London, and the centre of Birmingham and Liverpool, who had what in 1851 was a reasonable sized district, and now by 1871, or 1881 it’s ridiculous. I mean occasionally you can see that they have to go into a second enumeration book, or they’ve run out of paper and they start ruling their own on blank sheets and sticking them at the end. As I said, I have been looking at the census on an almost daily basis for about the last 20 years and I’ve seen it all (well no, I probably haven’t, but I’ve seen a lot). The enumerators: it wasn’t very easy to recruit enumerators. There were various conditions; they were supposed to be people of good character, and ideally literate, but that didn’t always work, they had to be people who were willing to do it, or by virtue of their job could be suborned into it, and they had to live within the area and had to have a good knowledge. In practice, anybody who was willing to do it was probably OK. The experiences of the enumerators are quite interesting. This book…is ‘Making Use of the Census’ by Susan Lomas, and it came out in I can’t remember what year, it was a long time ago. Now, in its day, it was absolutely the must have for searching in the census. It’s now so massively out of date because we look at the census in a different way. For one thing, there have been at least two if not three censuses released since the book was published, and it’s quite a charming historical artefact itself, because it even includes a plan of the census rooms in the basement at Chancery Lane. But what I still love it for is that it is peppered with little excerpts from enumerators’ comments which they put on the forms and I could spend quite an entertaining half hour just reading all of these out, but I’ll confine myself to a couple of highlights, and one of them is, another difficulty encountered was by an enumerator who said ‘the omission of the place of birth in the case of lunatics are too frequent, and I was utterly at a loss to make them out from their incoherency’, and another one, an enumerator explained, ‘consequent on a general row, when tables were turned over, three forms were destroyed, and the named of 37 persons, all males, of ages varying from 19 to 60 were lost’. It doesn’t say if that was in a tavern but I rather suspect it was. And there were a whole lot of these, and there’s another nice thing at the bottom of the pages, throughout most of the book, are the references for where famous or notorious people or interesting buildings have been found. So, if you find a copy of this, it’s massively out of date for helping you to use the census, but the incidental bits in it are absolutely wonderful, so if there’s a second hand copy knocking about it’s worth having. The picture on the front’s a bit dismal; somebody described that once as: ‘a family who look as if their house is about to be repossessed.’ Strangely enough it’s the picture we also had many years ago as the Public Record Office official Christmas card. I have no idea why. So the experiences of the enumerators are quite interesting, and despite all the moans and groans, and there were plenty, quite a number of them did it again and again, so they were either desperate, or just enjoyed a good moan. From 1891, women could be enumerators. In practice I suspect some of them may have been before that, they were just officially in a man’s name. They could actually be assistant enumerators; it was supposed to be the enumerator who went round and did the delivering and the collecting, but for the writing up and any other incidental clerical work, sharpening the pencils or something, they were allowed to enlist an assistant enumerator, although that had to come out of their fee, so that was entirely up to them. And the payment was essentially on piecework. They got paid so much per 100, or per 60 or whatever it was. Obviously this would vary from census to census, and probably didn’t get adjusted as much as it should have done with inflation as the years went by but then that’s government employers for you. There was a test case; in 1851, a man called John Curry who was an enumerator in Whitechapel, sued the Home Secretary for ten pence (that’s ten old pence). In that year, the enumerator’s allowance was one shilling for every 60 people over the initial 300. You got a flat fee for 300, and if your district was bigger than that, you got a shilling for every extra 60 persons that you did. Now, the case in point, this was a test case, was that the government claimed that you only got your shilling for every complete 60 persons enumerated. If you had 119, that was one complete 60, so you’d still only get your shilling, whereas the enumerator claimed that ‘no, this should be pro-rata’, so he was claiming ten pence, i.e. most of a shilling, because he had not done 60 but he’d done an awful lot. The Home Office refused to pay, and it went to court, and sadly judgement was in favour of the defendant, the Home Office because they always had the best solicitors, and there was widespread dissatisfaction. If you look in the newspapers you’ll find disgruntled meetings of enumerators. It strikes me that it wasn’t a very smart thing to do, to refuse to pay them pro-rata, because if I were an enumerator, and I had one or two short of 60, I’d make a couple up! I wonder if any of them did? I have reason to believe that some people who were enumerators one year, and came back and did it in another one, had sometimes learnt a trick or two. I have yet to prove it, but I have a case on the boil. 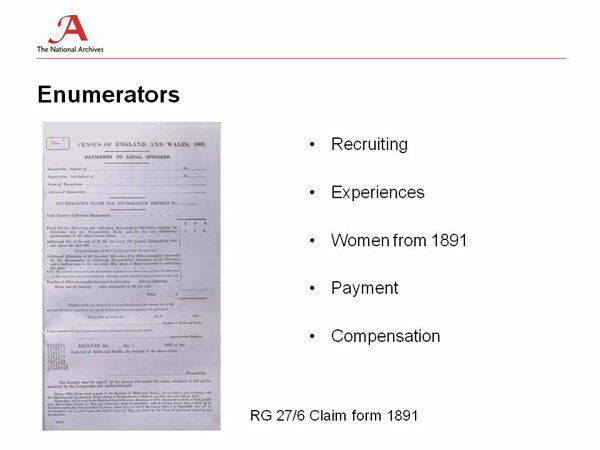 There were also elements of compensation, and this is not for straightforward payment, this is compensation as in industrial injuries, and we have quite a lot of files on this, mainly from the 20th century, and I suspect it’s just because that was when they started keeping them, but there were a number of cases where enumerators were claiming for compensation for injuries. Now this is something you probably will have seen; it’s the title page for an enumeration book. But on this particular one, you’ll see there’s a little slip there. The enumerator was the Reverend Whitehead, but he had an assistant enumerator, and this is 1871, and his assistant enumerator was an ‘old lady, who was upwards of 73 years of age’, and she was the one who actually wrote out the enumeration book. My mother is 77, and she’s not very impressed with the ‘old lady’ being upwards of 73 because she doesn’t think that’s terribly old and neither do I, frankly. Jumping right forward to 1911; I mentioned that sometimes I thought enumerators learnt a thing or two. Now you’ve probably looked at 1911 schedules. You may not have looked at one of these: this is the enumerator’s summary book. While the enumerator did not write everything up into an enumeration book, as we are familiar with from earlier censuses, they did a summary of their district, and all you’ll get there is just the schedule number, the address and then the name of the head of household, and you get a summary of numbers of males and females there. Now I know Rock Avenue very well as you’d expect. My brother lives there and it’s directly opposite where I went to school. It’s a street of terraced houses. They were built in the 1890s, and I thought, ‘Great! 1911, I could see who was living in my brother’s house!’ No, I can’t. Because the numbers there jump, they go from the bottom; they go 70, 72, 74, 76, 78, 80 and then they jump to 92. My brother lives at number 84. There’s a whole chunk missing from there, and I thought ‘That doesn’t seem right’. They are terraced houses. They’d been built for a long time. If they were empty or unoccupied, or maybe there’d been a fire, it should say ‘uninhabited’ or ‘being built’ or whatever, and it doesn’t. I looked at the rest of Rock Avenue, which is conveniently split between two enumeration districts as it happens, and in this particular district, there are quite a lot of unexplained gaps. I know these houses have not been renumbered. I know that there should be houses in between, and I made a list of all the numbers that should be there that weren’t, and there were no ‘uninhabiteds’ or anything. And then I looked at the district in more detail. Now on the left, quite coincidentally, is Windmill Road; that was right at the beginning of the district. The enumerator lived in Windmill Road, and in Windmill Road, which is a very very similar street, same sort of housing, terraced; there don’t seem to be any gaps there, and Rock Avenue…was right at the end of the district. Now it’s not a big district, it does not take long to walk from one end to the other, but by reconstructing the whole thing, and being cynical, I think that the enumerator was pretty thorough with Windmill Road because it was on his doorstep, and I think he probably went round and collected all the schedules, and some people won’t have been in. So he went round a second time, and maybe a third time, but I don’t think he bothered as the days went on. He probably got less enthusiastic, and there is a distinct pattern there; the closer it is to his house, the more complete it is, and by the time you get to the outer reaches of Rock Avenue (which is all of five minutes’ walk away) there are lots and lots of unexplained gaps. I looked into it. He’d been an enumerator in 1901, so I think he knew how the system worked, and I have yet to prove this, because I want to look at rate books, and I want to look at the Valuation Office survey which we’ve got upstairs, but I think he gave out all the schedules, and I don’t think he numbered them until he got them back. Because you can see the schedule numbers there; they’ve all been written at the same time and quite fast by the look of it. That doesn’t seem right to me. But it’s a nice example, if I’m right, and I may not be; I will ‘fess up and say, ‘No, I misjudged him’ if it turns out I am wrong, but it’s a nice example of human behaviour, and it makes you think these were real people, just doing a job, and trying to get it done as best they could, as quickly as they could and get their money, for the least amount of effort, and who of us hasn’t been guilty of that? So this is an interesting example of what I think an enumerator was up to and how they learnt as they went along. If I do find this, I’m going to write it up, that’s going to go in ‘Ancestors’, or at the very least on the website. OK, that’s enough of enumerators. Once they’d collected all this information it got sent to Somerset House, and then on to Craig’s Court or Milbank or wherever it was, and a whole army of civil service clerks, most of them temporary, set about doing what was the object of the exercise; all the number crunching and tabulating, and there are instructions. 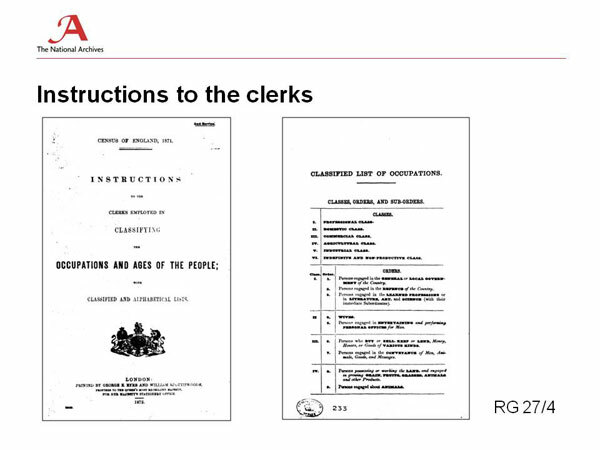 Actually there are lots of instructions; there are instructions to registrars, to Superintendant registrars, to enumerators, there are instructions to householders, there are instructions to masters of workhouses and masters of vessels. 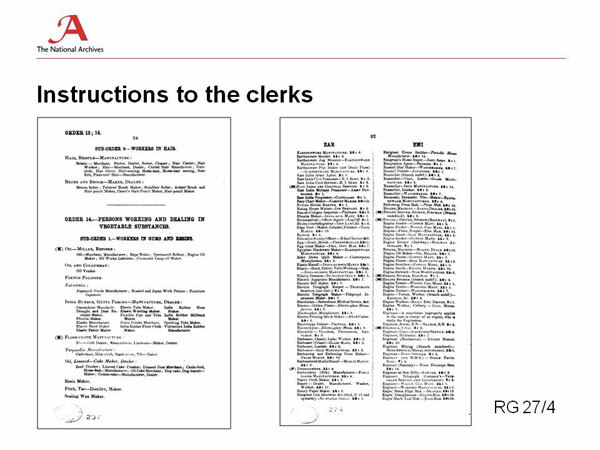 There were instructions to the clerks, and there were lots of different instructions, but the one that’s really useful, and is terribly underused, is this one which is the: ‘Classified List of Occupations’, and we call it: ‘Instructions to the Clerks’. It was produced from at least 1871, possibly from 1861, for every census year. We’ve got bound copies of this for 1881 and for 1901out on the reference desk for the open reading room, and I think we’ve got one on the open shelves as well. It’s the ‘Registrar General’s Classified Lists of Occupations’. It doesn’t define anything, but they’re arranged by classes; by their order and sub-order, and these are the numbers. Very occasionally you’ll see a number written in against an occupation on a census page, something like 18/2, and if you look that up, that will usually turn out to be an order and a sub order. That’s just the title page and the beginning of the classification. This is a bit further down; we’ve got an order, and I picked this one at random. It happens to be order 14: ‘Persons working and dealing in vegetable substances’, which includes various millers, oil and colour-men, and then Indian Rubber Gutter perch, and manufacturers, elastic fabric makers and so on; occupations you had no idea existed. And at the back of the book, there was an index to it, and if somebody says ‘I can’t read this, what does it say?’ and we say ‘Oh, it says such and such’, they say ‘Fine, what does it mean?’ ‘No idea’. You go and look at instructions to the clients. You look it up in the index at the back and it gives you an order and a sub-order number and then you go and look at the body of the thing and again it doesn’t define it, but it tells you where it is in the scheme of things, so you can often work out what somebody did, or at least what industry they were in, even if you have no clue what a ‘self-actor/minder was. It’s just quite a nice read, just flipping through and seeing these weird and wonderful occupations. Now 1911 was different because they automated it. By 1901 it had really reached the extent that it could with manual tabulating. The forms that they tabulated the results on with the sort of tick sheets, made me realise what a spread sheet is, because you have to spread them out on a really big table and they’re about the size of a sheet, and you couldn’t really get any further manually, but in 1911 they automated it. This is just an example of a couple of the machines that they used: there were the punch card machines and the sorting machines, and the punch card, which really is exactly the same size as the American dollar bill size with the corner cut off, and which they were still using when I started working in the 1970s. 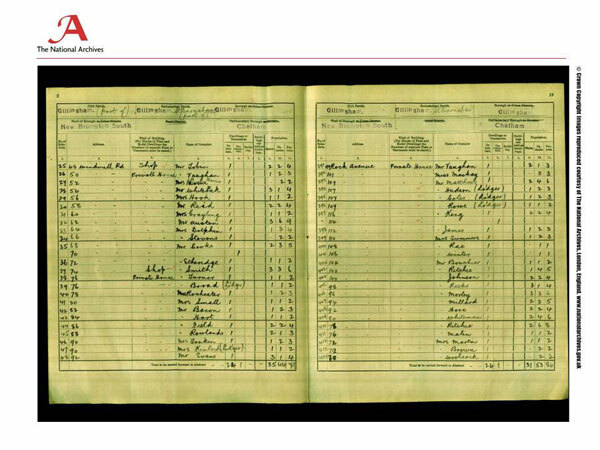 They came back and they introduced ‘Hollerith’ machines, so that is why 1911 doesn’t have enumeration books, because you could do all the enumeration from the schedules. They needed experienced clerks to translate what was on the census forms into numbers that could be punched, and the punching was done by girls, because girls are cheap and accurate, and specifically it was from girls who were leaving elementary schools in the region around Milbank, in spring 1911, and they were the girls who did the punching. The instructions to the clerks go on for pages and pages and pages. The instructions to the punchers were about two sides. The other one, which you sometimes notice and maybe wonder about; down at the bottom there where you’ve got the totals of males and females, there’s a little number two, and the children under ten years old. It doesn’t tell you what that is, but that’s what it is. (Not much use for anything but a nice bit of trivia. Not even any use in pub quizzes but you never know.) And that’s sort of how it was done. We’re quite lucky to have the census. 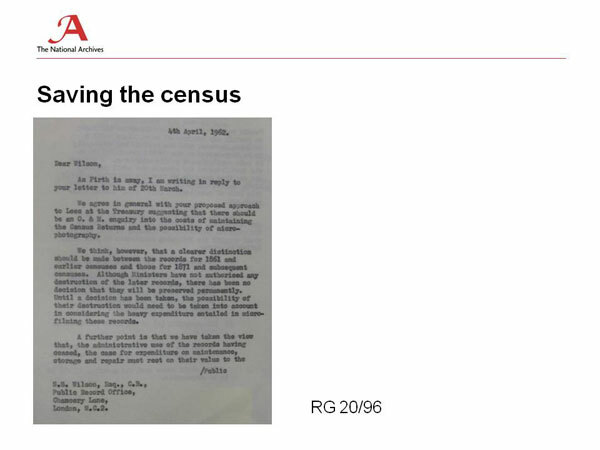 This is a letter that I found from as recently as 1962, which shows that it hadn’t been decided whether or not the 1871 census was going to be kept or not. It was taking up an awful lot of space, and it could have gone on a bonfire. That’s really terribly recent. It says: ‘A further point is, we have taken the view that as the administrative use of the records having ceased, the case for expenditure on maintenance, storage and repair, must rest on their value to the public’, which in 1962, they weren’t at all sure that there was any value. Well, minds got changed, fortunately, but there have been a number of occasions when whole censuses very nearly got binned. 1851 and 1861: if it were not for the Registrar General who took over after George Graham, they might well have been thrown away. The local government board just viewed them as so much waste paper and would have happily put a match to them, but the Registrar General said he thought that maybe it would be a good idea if they kept it because they might come in useful one day, so – eternal vigilance, People! Now, I’m going to finish with a bit about 1921, a nice little cautionary tale. Government and the census authorities have often been approached by people wanting to advertise on census stationery, because if you think, that’s an awfully good way of getting something to every household, and the government always refused. So they did, and they approached an advertising agency who said ‘Oh yes, I’ve got a client who’d really like to advertise. He’s going to be launching a new newspaper, and this would be a fantastic way of advertising it.’ Well, a newspaper, that’s fine, so that’s the postponement notice, and that’s the back of it that says ‘The Sunday Illustrator, a picture paper for men as well as women’, blah, blah, blah. And this went out. Now this was in 1921 and a little later that year, this whole scandal blew up. This is 1922, because it rumbled on. [Gives examples of headlines of the time]:’The MP Horatio Bottomley: notorious fraudster!’, ‘These poor people trusted you!’ This rumbled on for months and months, it was in all of the headlines, and if you can think of a combination of Robert Maxwell being discovered having stolen the pension fund and Jeffrey Archer going to prison, [the scandal] was on that scale. And that, I put it to you, is why the census has never since had any advertising on it.